This organization tool with 10 hooks for hanging cook utensils, cutting board, pots, pans and dish towels. two cups can store knives, forks, spoons, chopsticks, and even toothbrushes. four knife slots can store all kinds of the size of a knife, such as kitchen knife, fruit knife. the shelf space can store cups, tableware, spices, condiments, cans and jars. The hollowing cup can keep dry inside and the special stripe design will be easy to clean.this modern kitchen hook will prepare you an organized and tidy kitchen experience. 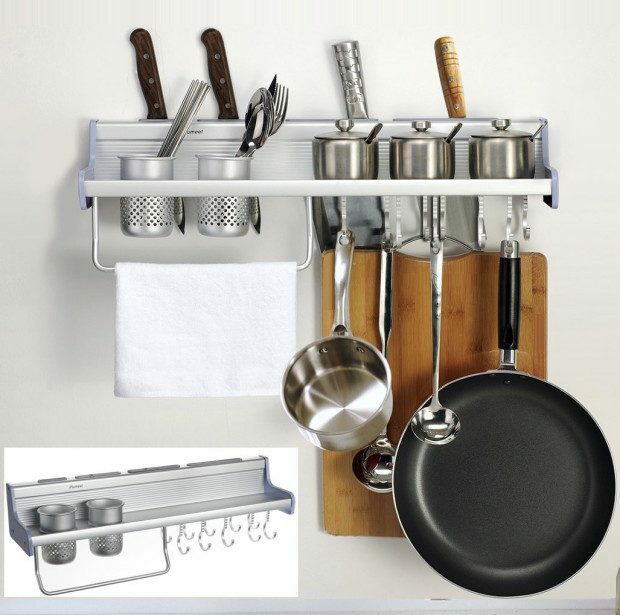 Kitchen rack can withstand 40 pounds, it’s also light weight (just 1.9 pounds), the organizer easily mounts to wall. so you won’t need a handyman to install it. This kitchen rack keeps your kitchen organized while looking great. features a polished oxidized finish and combines durability with elegance, the simple and modern style fits seamlessly into almost any decorating style.